It’s only Michael Volk’s sophomore year of college at Iowa State University (ISU). Yet Volk has seen his name as first author on a research paper and has taken leadership positions in the campus chapter of the American Society of Civil Engineers. 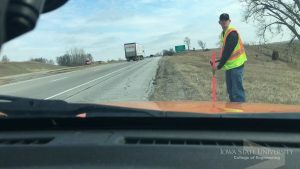 He is also currently involved in the University Honors Program and is on co-op with the Iowa Department of Transportation (I-DoT) within its office of traffic operations. Volk’s research experience is especially unique. He started research as a freshman and will admit that the beginning of the research process can be a bit daunting. Literature review, for example, can seem overwhelming at first due to all the new material, he says; however, the civil and construction engineering faculty with which he has worked are always willing to give direction. “I’ve just enjoyed it because, if I have questions about something, they’re always willing to help me,” he says. Volk works during his co-op with the Iowa DoT. Photo courtesy Volk. Along with research, Volk has be an active leader in ASCE. It’s an opportunity that teaches leadership and valuable communication skills.